1. Vegetables – All types are high in fiber and low in fat; they should be included in all of your cholesterol lowering recipes. Try mixing kale and collards or peppers and onions, a traditional blend. 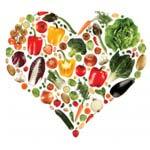 Vegetables help the body increase HDL cholesterol levels. 2. Fruits – Look for fruits that can be eaten without peeling; this is where most of the fiber lies. Apples, pears, peaches and plums are all good choices. Cranberries and grapes are also great anti-oxidants. 3. Beans – Some nutritionists believe that an increase in cholesterol free foods like beans can reduce bad LDL levels in just a few short weeks. Others debate this claim, but agree that beans are an excellent source of fiber. They are versatile and can be eaten in soups, dips, spreads and salads. 4. Whole grains – Bread with whole and grains with more than two grams of fiber in each slice is best for lowering cholesterol. In addition to bread, there are a multitude of cold cereals available as well as brown rice and pasta. If you like to bake, substitute white flour for whole wheat or rice flour. 5. Fish and poultry – Both of these types of meats are high in protein and low in fat. Be mindful of shrimp or other shellfish which are naturally high in cholesterol. 6. Egg whites – Many people underestimate the power of egg whites, but they have protein and zero cholesterol. Create omelets, cakes and cookies using egg whites and skip the yolk which is loaded with cholesterol. 7. Oatmeal – Also high in fiber which contributes to lowering the LDL cholesterol levels. Mixed with fruit, it makes the perfect breakfast. 8. Olive oil – Olive oil contains anti-oxidants that reduce LDL cholesterol levels and is considered heart friendly by chefs all over the world. If you must use oil to cook with, choose extra virgin oil instead of butter or margarine. 9. Dairy – Fat free and cholesterol free only. With so many supermarkets becoming health conscious, you shouldn’t have any problems locating all types of cheeses and yogurts that contain zero percent cholesterol. 10. Red wine – Red wine is made from grapes which are also great for lowering LDL cholesterol levels. So there you have it, the top 10 cholesterol free foods. As you can see, you should never become bored or run out of ideas just because of your high cholesterol. You just need take the plunge and begin creating. Do you want to read more about how cholesterol and food partner together? Then read other articles about cholesterol lowering diet plan.